I'm going all out with my boys tops this year aren't I. Graphic tees all over the place, not a placket in sight. 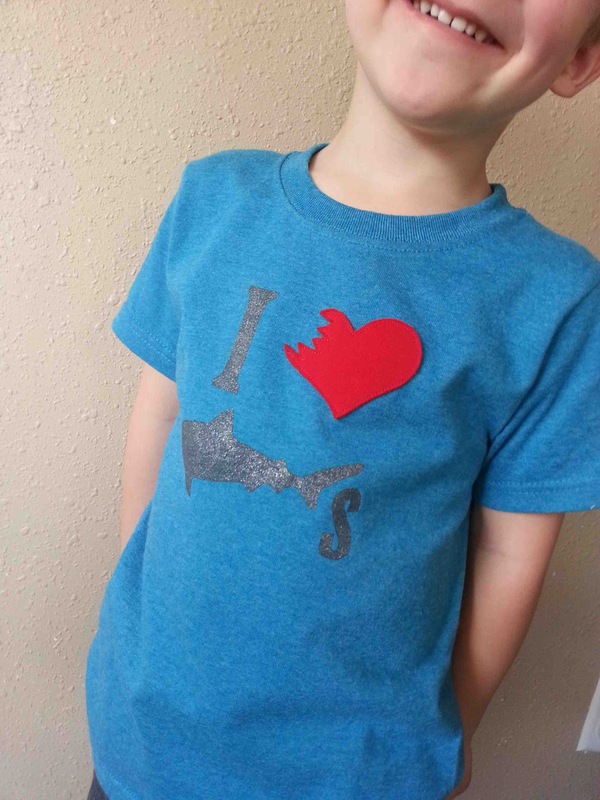 I realize that not everyone loves sharks, or wants a shark shirt, but my little guy happens to love them. When I say love, I mean he's a bit obsessed. We started calling him Clark the Shark a while ago, and now he thinks that he is a shark. The other day he told me "Mom, when I die I want Heavenly Father to make me into a shark". I told him he'd have to talk to Heavenly Father about that, so he went on the back porch and said a little prayer to ask Heavenly Father to turn him into a shark. He also request fish for nearly every meal, including breakfast, "because that's what shark's eat". Should you have a shark lover in your house, you can find my pdf pattern here. Download it for personal use. The shirt is pretty basic. It's a freezer paper stencil with a felt/knit applique. 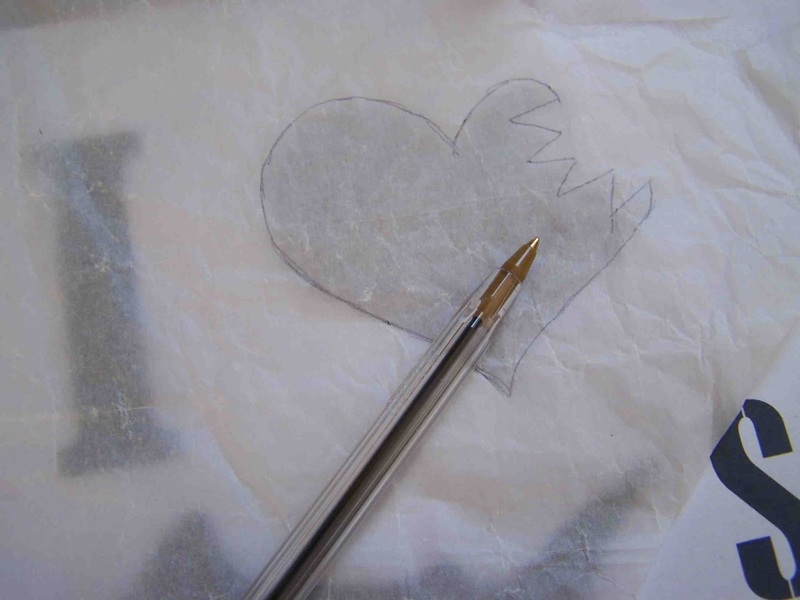 I like layering knit onto my felt, because I feel like it's not going to pill in the wash.
To start with, trace the heart shape onto the paper side of your fusible web. Cut out leaving some room around the shape. Adhere to the wrong side of your knit fabric according to manufacturers directions. 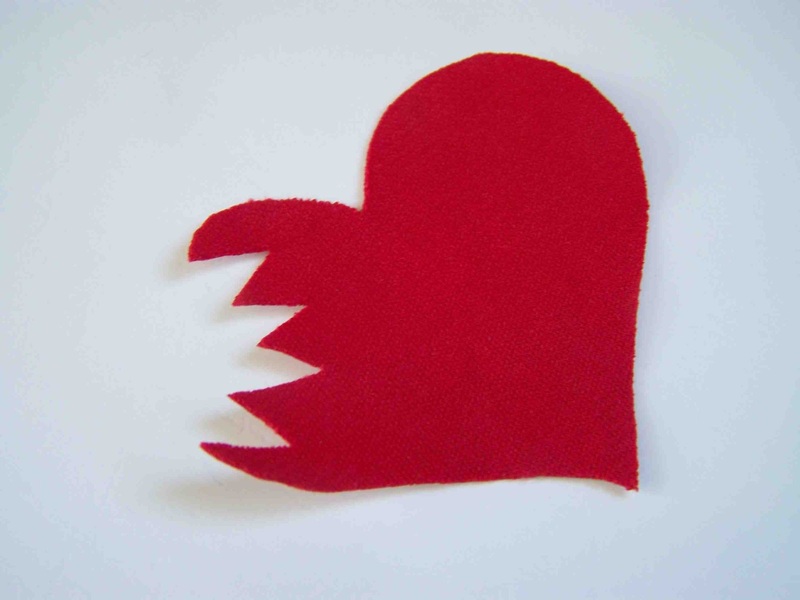 Once the web as cooled, cut out your applique shape. 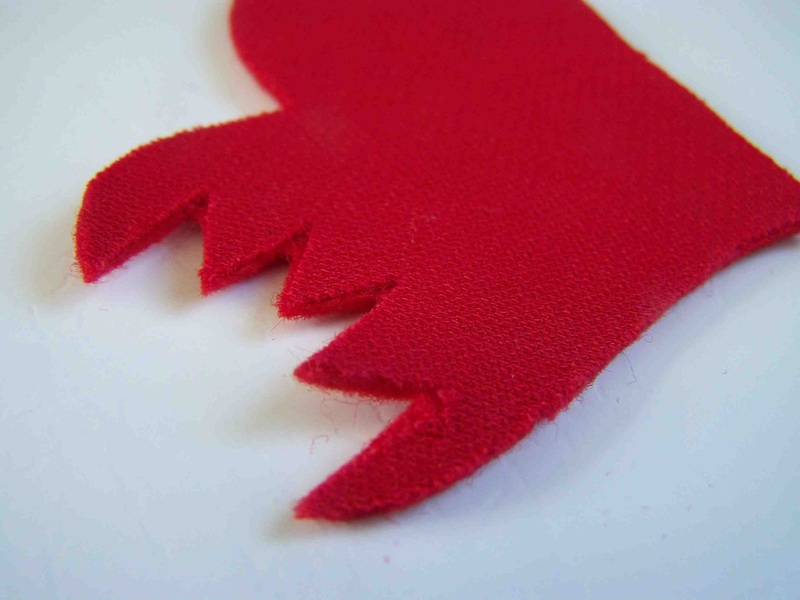 The felt adds dimension to the applique which I love. I also used this technique with Clark's Mistletoe League shirt. 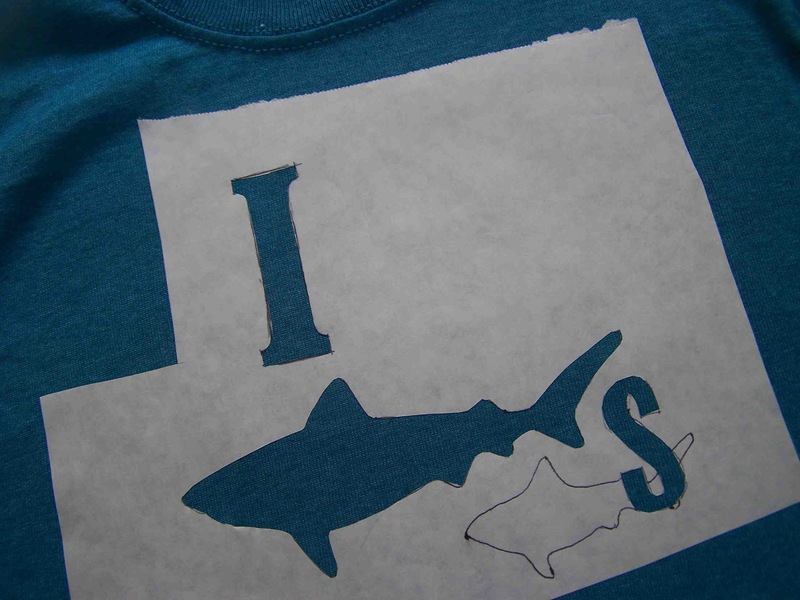 Transfer your shark stencil to the freezer paper. Cut out with an x-acto knife. Adhere to the t-shirt. Tutorial here. Using your foam stencil brush paint the open areas. 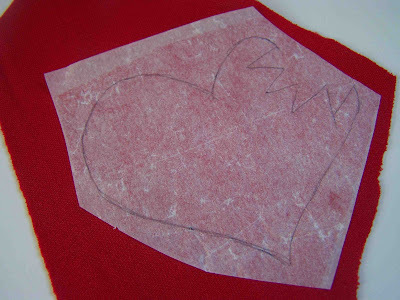 Next applique the heart in place. You can find my tutorial for creating knit appliques here. I love combining the stenciling and applique techniques, it adds another dimension to an embellished shirt. Um, can I just gush about how much I love this??? ADORABLE. What a great way to add personality to a plain shirt. I'm pretty sure we have plenty of stained shirts that could use new life, and hopefully find one that I can strategically paint over. Totally pinned. Thanks for the idea!!!! Clark's reasoning is awesome. :) Fun dimension with the felt and knit. I usually like sharks except my friend was asking where the shark attack was in CA and I read too many stories about it.